The first PES 2015 Weekly Update was made available to download across all platforms today. 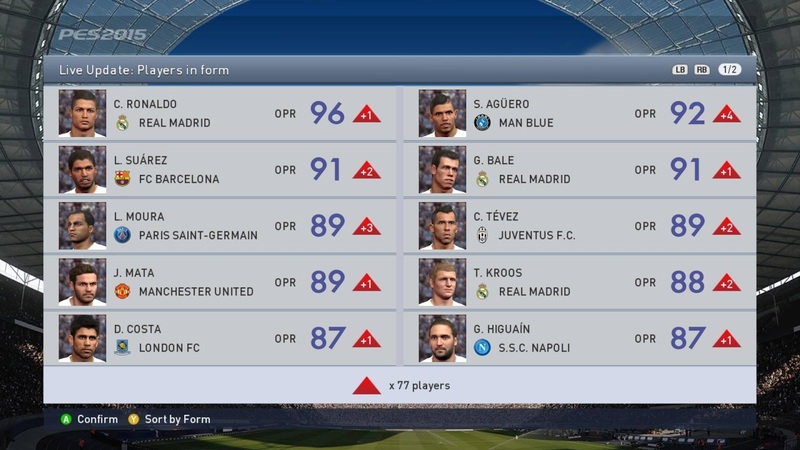 The first PES 2015 Live Update is based on the week from November 3 to 9 and affects 77 players from the English, French, Italian, Spanish and Brazilian leagues. Team lineups and transfers are also updated with the PES 2015 Live Updates. Which players are affected by the first PES 2015 Live Update? A total of 77 players was downgraded or upgraded by this first weekly PES 2015 update - 11 players were decreased while 66 players got boosts for their great performances lately. Most notably, Cristiano Ronaldo is now the single best player in PES 2015, after gaining one more overall point he's now rated 96. Sergio Agüero received a huge upgrade of 4 points and is now at an overall value of 92 - he's now the 5th best player in the game. Lucas Moura is raised by three overall points to 89 following his good performances for PSG at the start of the season, while a lot Juventus players also received deserved upgrades affected by their incredible league form. Check out the official DLC 1.00 PES 2015 Database at PES Master - PES 2015 Database. Image and video by WENB ES. Please note that the PES 2015 online servers are currently in maintenance and that the update cannot be downloaded at this time.